The Mario Baseball series is a spin-off series of the Mario franchise that revolves around the concept of baseball. Only two games have been released to date: the first one, Mario Superstar Baseball for the Nintendo GameCube, and the second one, Mario Super Sluggers for the Wii. Unlike previous spinoffs, the player could recruit people via completing scout missions to get enough scout flags to recruit the player on one of the four opposite teams. Another unique feature is chemistry, which effects how well the player's teammates cooperate. Even though there are only two baseball games, this series features more playable characters than other spinoff titles in the Mario franchise. Mario Superstar Baseball is the first installment in the Mario Baseball series. It features a total of thirty-two playable characters (not counting alternate characters), six of which can be unlocked. These characters are divided into four different groups: balance, technique, speed, and power. The game also features three characters from the Donkey Kong franchise: Donkey Kong, Diddy Kong, and Dixie Kong. The game also has a unique feature called chemistry. Chemistry is the relationship status found between the team captain and its players. The better the chemistry between the characters, the better that team will likely perform. Should a team have bad chemistry, they may perform poorly in the game. Six mini-games were also featured in the game, one of which is unlockable. Mario Super Sluggers is the second and most recent installment to the Mario Baseball series; it was released for the Wii in 2008 in Japan, South Africa, and North America; however, it was never released for the European, Australian, and South Korean regions. The game takes place in the Baseball Kingdom. The game features a total of forty-one playable characters (not counting alternate characters), nine more than the original. All of the previous game's characters were reunited in the sequel, and they were all default. The nine new ones must be unlocked. There were a total of nine stadiums to play in, four of which had to be unlocked; each stadium, unlockables included, had their own unique mini-game for the player to engage in. The game also featured many cutscenes, each of which told a story to give the game a more involved aspect of gameplay.The Challenge Mode was changed from going around playing other teams to recruiting players by clearing special missions for more of a RPG feel. This game can switch between day and night. This is useful because Bowser Jr. Playroom can only be played in during the day and Luigi's Mansion and Bowser's Castle can only be played in at night. Nintendo 3DS Mario Sports Superstars is a 3DS game released on March 10, 2017 in Europe. Baseball, developed by Bandai Namco Studios like the main series, is included as one of the five sports available. A unique feature in the Mario baseball series is chemistry, which decides how well the teams play. For example Mario and Luigi have good chemistry so when they throw a ball at each other it travels fast. An example of bad chemistry is Mario and Bowser: if they throw to one another, the ball moves slowly and off course. If two characters have no chemistry, like Mario and Diddy Kong, the ball would fly at normal speed. Chemistry also affects the number of Star Skill units; good chemistry with the captain increases the number of units while bad chemistry decreases it. The maximum number of stars is five. The quantity of the available Star Skills sometimes affects the name of the team. For example a team led by Mario with five stars would be called the Mario Fireballs. 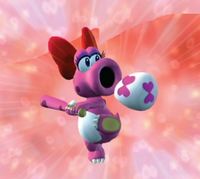 Birdo, using her Cannon Swing as a Star Skill in Mario Super Sluggers. A new feature in these games are the ability to use a Star Skill. Star Skills can be activated either while pitching or while batting. Anyone in this game can use a Star Skill, but a team captain's Star Skill is superior to a sub-character's Star Skill. Team Captains have mostly different Star Skills, however, captains that usually pair with each other (Mario and Luigi, Peach and Daisy) have similar Star Skills. The amount of Star Skills that can be used is represented by five Team Stars in a meter. The amount of starting Team Stars depend on the sub-characters' chemistry with the team captain. Mario, using his Fireball as a Star Skill in Mario Superstar Baseball. Star Skills can be replenished by hitting ball park features. They can also be replenished by striking a player out or making a batter reach a base safely when the words, "Star Chance!" appear. Team captains use up one Team Star, sub-characters use up one Team Star, and captains as members use up two Team Stars. They return in Mario Super Sluggers, however some characters, especially the sub-captains, like Luigi, now have different star skills. The window at the bottom that shows star skills is different. Overhead view of the Baseball Kingdom. Group Picture from Mario Superstar Baseball. Group Picture from Mario Super Sluggers. The title screen for Mario Superstar Baseball. The title screen for Mario Super Sluggers. Selecting characters in Mario Superstar Baseball. MVPs in Mario Superstar Baseball. The Captain Select screen from Mario Super Sluggers. The Team Setup screen from Mario Super Sluggers. The shop in Mario Superstar Baseball.